We know that southern California is subject to frequent -- and sometimes very destructive -- earthquakes. Forecasts of future quakes help us prepare for these inevitable events. But scientists cannot yet make precise predictions of their date, time, and place, so earthquake forecasts are in the form of probabilities that quakes of certain sizes will occur over longer periods of time. Larger imageThe Composite Forecast -- UCERF The final forecast results from evaluating and integrating several types of scientific data. This map shows the likelihood of having a nearby earthquake rupture (within 3 or 4 miles) for all areas of California. Areas along major faults (numbered) stand out as having the highest probabilities for earthquake rupture. The most comprehensive statewide analysis of earthquake probabilities (see above maps), determined that the chance of having one or more magnitude 6.7 or larger earthquakes in California over the next 30 years is 99.7%. The fault with the highest probability of such earthquakes is the southern San Andreas -- 59% in the next 30 years. For powerful quakes of magnitude 7.5 or greater, there is a 37% chance that one or more will occur in the next 30 years in Southern California. Expected Shaking This map builds on the map of likely earthquakes above to show how those earthquakes will shake the region. Bands of highest shaking generally follow major faults, but shaking levels are also influenced by the type of materials underlying an area -- soft soils tend to amplify and prolong shaking, even at great distances from a quake. In addition, deep soils in valleys shake more than bedrock in the hills. Unfortunately most urban development is in these valleys. 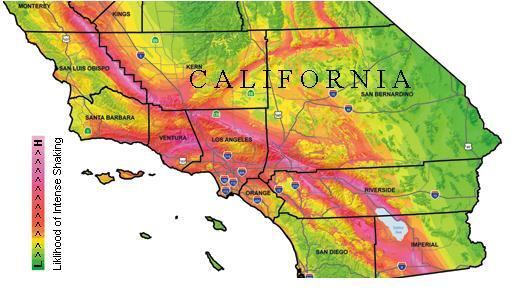 A seismic hazard map produced by the California Geological Survey is shown above. Areas in red and pink are more likely to experience strong earthquake shaking. The map adds together shaking from all potential earthquakes. Smaller earthquakes will only cause shaking locally, while larger earthquakes may cause strong shaking throughout southern California. A popular literary device is a fault that opens during an earthquake to swallow up an annoying character. But unfortunately for principled writers, gaping faults exist only in novels. The ground moves across a fault during an earthquake, not away from it. If the fault could open, there would be no friction. Without friction, there would be no earthquake. 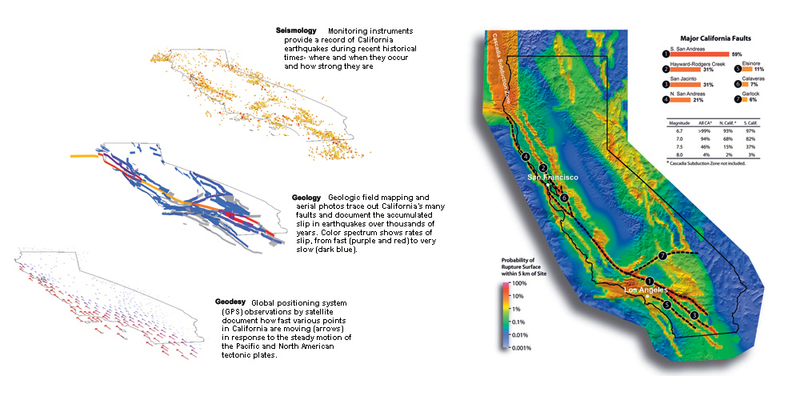 Multidisciplinary groups of scientists and engineers, each known as a "Working Group on California Earthquake Probabilities (WGCEP)" have developed earthquake forecasts since 1988. The 2007 WGCEP was commissioned to develop an updated, statewide forecast. The result is the Uniform California Earthquake Rupture Forecast, available for download at www.scec.org/ucerf. Organizations sponsoring WGCEP 2007 include the USGS, California Geological Survey, the Southern California Earthquake Center, and the California Earthquake Authority. The comprehensive new forecast builds on previous studies and also incorporates abundant new data and improved scientific understanding of earthquakes.